Paying homage to the British style heritage, the McQ collections embody youthful silhouettes and edgy cuts full of rebellious and punk-influenced vibes, as showcased by this black and white floral print jumpsuit. Featuring a halterneck, a v-neck, a sleeveless design, a concealed rear zip fastening, a fitted waist, side pockets, a straight leg and a cropped length. A slightly more alternative option for your closet, women's jumpsuits are some of the most popular items right now. 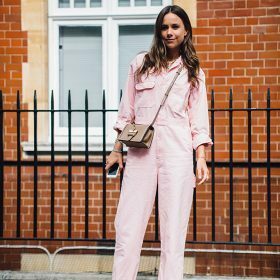 The trend has taken over for the year, swap out your pair of denim overalls for a pastel colored jumpsuit for your next vacay - and finish off the look with a pair of classic Converse sneakers. We are currently loving jumpsuits as formal wear, pick a black jumpsuit and pair with some heels and a killer bag and you are ready to go. Use the category filters to find the perfect colour, style and size for you.